One of my biggest gripes is the use (or misuse) of the “teaching Mass.” To me, it feels like preparing a feast for your beloved — perhaps for a significant anniversary or to celebrate a big promotion — and then stopping every two minutes to explain what the candles mean and how she should properly cut her steak. The artistic use of symbols and symbolic actions in the liturgy can never be fully explained in a didactic format. No human art form can ever fully express the divine mystery. The arts, however “can, like the world itself, be icons, avenues of approach, numinous presences, ways of touching without totally grasping or seizing” (Environment and Art in Catholic Worship, 2). The overriding criterion for any aspect of liturgy is the prime directive from the Second Vatican Council that the “full and active participation by all the people is the aim to be considered before all else” (Constitution on the Sacred Liturgy, 14). So how do we determine if our liturgical environment actually enhances the participation of the assembly? Liturgical symbols must be inviting and hospitable. This includes the worship space itself. Everything about the liturgy should draw people in and help them feel involved. This means the symbols we use have to be big enough to be seen, sensual enough to be touched, scented enough to be smelled, and loud enough to be heard. We should be able to move through the worship space with a sense of each and grace. The liturgical focal points should be clear and balanced. On other hand, our symbols and spaces need to open us up to the experience of mystery. “This involves a certain beneficial tension with the demands of hospitality, requiring a manner and an environment which invite contemplation (seeing beyond the face of the person of the thing, a sense of the holy, the numinous, mystery)” (Environment and Art in Catholic Worship, 2). This experience of mystery, which invites contemplation, is not especially valued these days. Much of our lives outside of liturgy is designed to demystify most of our experiences. Or at least that is my perception. Perhaps every generation complains about the values lost as younger people begin to inhabit our worlds. But it does seem clear that most things, including imaginative experiences, are more commodified now. “A culture which is oriented to efficiency and production has made us insensitive to the symbolic function of persons and things” (Environment and Art in Catholic Worship, 16). When we come to liturgy, are we more likely to expect Wikipedia-like experiences in which everything is reducible to bulleted explanations of why Father is wearing green today? Or do we instead enter onto holy ground, prepared for awe and wonder? In order for art to truly serve the full participation of the people, our symbols have to be real. We have to clear away anything that is “careless, phony, counterfeit, pretentious, or exaggerated” (Environment and Art in Catholic Worship, 14). Now you might not have an artistic bone in your body, but common sense can help us avoid the careless and phony dross that clutters our worship spaces. It doesn’t take a wealth of artistic talent to get rid of fake flowers and oil canisters pretending to be candles. You don’t need an MFA to declutter entryways and sanctuaries. For those of you who do have an artistic sensibility and who may be responsible for creating or procuring liturgical artifacts, there are two more criteria to consider: quality and appropriateness. “Whatever the style or type, no art has a right to a place in liturgical celebration if it is not of high quality and if it is not appropriate” (Environment and Art in Catholic Worship, 19). There are a lot of knock-offs in the world. It is easy to find liturgical artifacts that pretend to be made of precious materials when they are in fact cheap imitations. However, you know when you touch or gaze upon something long enough if it is cheap and fake or honest and true. “Quality means love and care in the making of something, honesty and genuineness with any materials used, and the artist’s special gift in producing a harmonious whole, a well-crafted work” (Environment and Art in Catholic Worship, 19). The art that we use in the liturgy must be appropriate in two ways. First, it has to be able to “say” who God is. For example, a plastic water bottle that is used to fling water at something as an attempt at blessing does not convey the mystery of the divine. However, a beautiful full-immersion font, constructed of polished granite and overflowing at our feet gives us a window onto the holy. And second, art has to serve the liturgy. If on the feast of St. Matthew, we place Caravaggio’s depiction of the saint’s calling at the foot sanctuary, we do a disservice. The paining is beautiful in its own right but only serves to interrupt and distract from the liturgical action. The most important symbol in the church is the church itself. Not the building, but the people in the building. In the old days (like third-century-old), whenever you said “church,” you meant the assembly of believers. If you wanted to talk about the building, you said “house of the church.” It is because the assembly of believers is so important that teaching Masses disturb me so much. What the church does when it worships is enact the divine. Our action, in and through Christ, makes God real in the world. A teaching Mass reduces the role of the believers to students in need of tutoring. We are, after all, members of the royal priesthood, a holy people set apart. We do not need tutoring. We need faith. And we need good art with which we give shape to that faith. 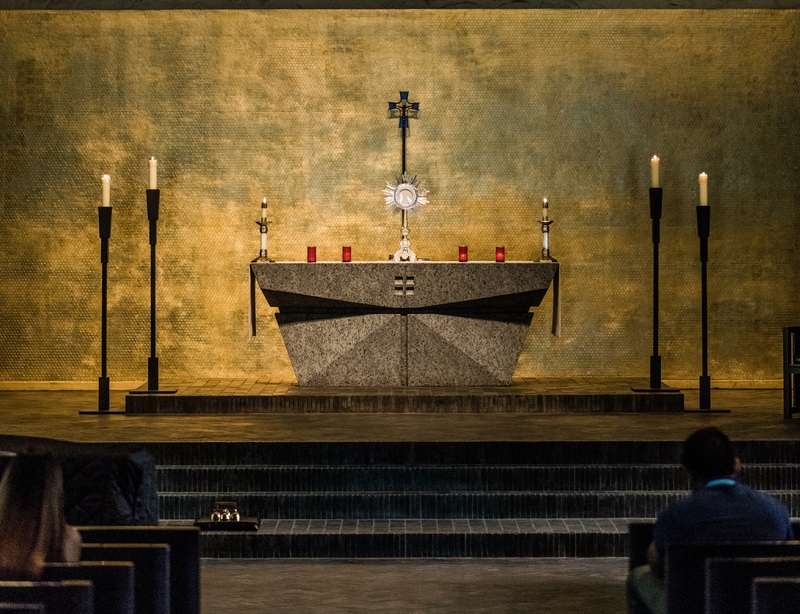 Who – or what – determines the liturgical environment for your parish? What do you use that “truly serves the full participation of the people”? What do you need to let go of? Share your thoughts in the comments below.